"Fashion is nothing...without accessories." That little quote hangs on my wall right next to my vanity. It has a picture of a tiny brass purse. For me, this statement rings true. When I peek into my closet, the things I love the most are my bags, shoes, and jewelry. And now, my one and only beenie can be added to that list. I love wearing basics. I take my fashion risks with my jewelry instead! Great outfit, you look gorgeous as usual! Accessories can make a huge difference. LOVE that ring! I have decided that you need to start doing more outfit posts...every time you post one I think you look adorable and I want to copy every look from head to toe. I agree with Ashley J! You always look so adorable and put together. 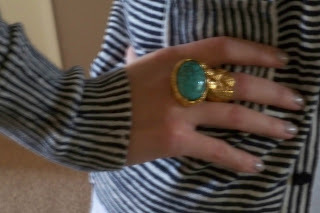 You have no idea how envious I am of your ysl arty ring! I hope you have a fabulous weekend! I love accessories and the YSL ring is amazing, great buy! Thank you so much girls! It was one of those days where I had no idea what to wear. Then I glanced over at my little quote and thought it was time to wear my Arty ring as well as the cute hat I got after Christmas. Nothing like some fun add-ons to make a simple look more unique! 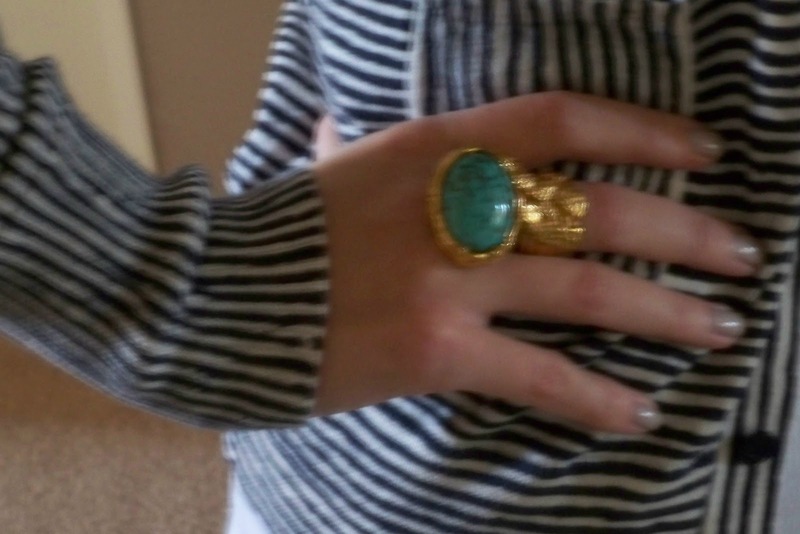 OMG I love your cardigan, it's so cute and that ring is really a statement piece....so hot! That is so true, fashion is incomplete without accessories. BTW, love that cardigan. I'm so jealous! Love the ring!!!! Fantastic from head to toe! The ring is fabulous! You have no idea how your kind comments brighten up my days. Thank you so much! I love that beanie on you...I only wish I had a "hat head" :). Very Cute! I've never seen you rock a beanie! You should do it more! Looks really cute and the ring looks great! Can't wait to see you on Sunday..a full week..hopefully it goes quick! Looking bee-you-tiful. I love me some big rings. DROOLING over that YSL ring! And your hat is too cute -- you pull it off perfectly! AHHHH love that YSL ring!! Eeee I've been wanting one for awhile. You look gorgeous! Question! How is that ring holding up? I want to buy it but am hesitating because ppl are syaying their ring is tarnishing/ stone is cracked/ stone is unevenly placed. What do you think? Purchase or pass? Cosmetix Queen: The ring is holding up well, although I've only worn it a couple of times. I am actually afraid of it tarnishing too so I don't wear it super often (plus, it's definitely more of a statment ring and I certainly can't wear it to my work). My stone is placed nicely and it was not cracked but I bought it at a YSL store where I could pick out my own ring. Overall, I love it and am happy with my purchase. If at all possible, I recommend buying it in-store so that you can see what your getting. It's so hard to say pass on this beauty!